If you want to programmatically download web pages in Ruby, the Mechanize gem can be used. When installing Mechanize, Nokogiri will also be installed. This provides a powerful combination where Mechanize is used to download content from the web and Nokogiri is used to parse the html. My Fetch Photo Bucket program shows an example of how to do this. I put the code on GitHub, but I wanted to show how the html parsing part of the script works. The program reads the url of a photobucket album from a file named AlbumUrl.txt. This url should be of an album page that displays all the thumbnails for the album. These album pages have a very consistent structure. Figure 1 - Parsing the photobucket album page in Ruby. 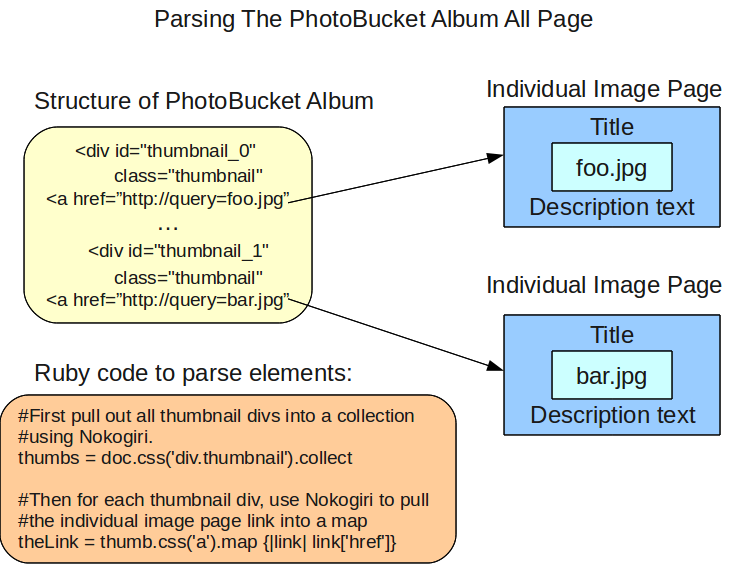 Figure 1 illustrates the structure of the photobucket album page and the Ruby code that is used to extract useful information. The photobucket album page uses a div with a class “thumbnail” to contain information for each photo in the album. Once the album page has been placed in a Nokogiri object, all the thumbnail divs can be placed into a collection with the following Ruby code. The Ruby collection can easily be iterated over with the each method. For each thumbnail div, the most important piece of data to extract is the link to the individual image page. The link to the individual image page is extracted with the following Ruby code. Once the link has been extracted, the mechanize library can be used to retrieve the individual image page. The individual image pages contain valuable information to retrieve. Namely, the title, the image itself and the description text. If the album creator has spent a lot of time giving each image a meaningful title and description, they will want to preserve this information. Figure 2 - Parsing an individual image page from photobucket using Ruby. Figure 2 shows how the title and description can be extracted using Nokogiri from the individual image page. The code is as follows. Pulling out the image source information requires using xpath. The img tag has an id of “fullImage”. The code to retrieve the src attribute from the image tag is as follows. Now that the image source information has been extracted, Mechanize can be used to download the image. It is then straightforward to create a static html page containing the title, image and description from the original photobucket album page. Blog page about the fetch photobucket script. Import html plugin for WordPress. Please let me know if I didn’t explain something thoroughly in the comments section below.